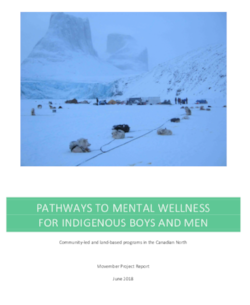 The goal of this project was to implement and evaluate community-led and land-based initiatives to promote mental wellness among indigenous boys and men across the Canadian North. The link below will take you to the final report prepared with the findings from the three year-long project. In early November, Kwanlin Dun First Nation (KDFN) organized a bison hunt on the traditional territory of Champagne and Aishihik First Nation (CAFN). This program ran a full 6 days, and was intended to provide an opportunity for young Indigenous men to spend time out on the land. The program had two paid guides, and in the spirit of partnership between the two first nations, included the KDFN Movember Program Coordinator and the CAFN game guardian. There were three additional guides, who were members of the KDFN community, that volunteered their support. The entire camp consisted of 17 people. There were no camp cooks or camp maintainers, as one of the goals of the hunt was to learn to work together, support one another, and learn what it takes to maintain a hunting camp. The camp set-up included four canvas tents and woodstoves for sleeping, and used an existing shack for cooking. Temperatures the first night plummeted to close to -25 C, so the participants quickly learned how important keeping the fire going at night truly was! Each day, the entire camp would gather at breakfast and divide themselves into hunting parties of two and three. Some groups would hunt in the lakes and grassy low lands, while others would climb the mountain to look for bison eating grass on windy slopes. The participants learned many things while on the hunt; a lot of information about bison habits: where they like to go, sleep, and eat. They also learned how to set up, maintain, and tear down a hunting camp, how to safely drive quads and cross different types of terrain, and how to look for bison and other animals, as well as how to set snares for small game. Being on the land, away from the city of Whitehorse, allowed many of the participants to give themselves the space needed to reconnect with a part of their identity longing to be revived or strengthened. Many of the men spoke about how this camp was the longest they have ever spent away from town, and that having experienced it now, it is something they will strive to participate in again. On October 6-9, 2017, our team members from all of our project sites attended the Northern, Rural, and Remote Health Conference in Happy Valley-Goose Bay, NL. This was an opportunity for us to present on the benefits we see in running our various land-based programs across the North to an audience of healthcare practitioners and decision makers. This was also an opportunity for our project sites to meet face-to-face, and have a chance to discuss our plans for the final year of this Movember-funded project. Representatives from the Movember Foundation were also in attendance, along with their colleagues and project sites from Australia, and it was a great opportunity to connect and share with Indigenous-led initiatives internationally as well. We are excited for the year ahead, and look forward to contributing to the evidence base for the mental health and wellness benefits of community-led land-based initiatives across Canada. CBC news reported that “the rate of suicide in Nunavut is 10 times higher than the Canadian average” and a “suicide inquest recommended the government pilot a community-based model like that used by Clyde River's Ilisaqsivik Society”. Dr. Michael Jong, president of the Canadian Society of Circumpolar Health, co-authored a paper published in the “American Journal of Public Health.” was recently interviewed by CBC. He talks about the high suicide rates in Labrador. In mid-February, we ran programs which combined the approaches of our Qimmivut (our dogs) and Ataata-Irniq (father-son) programs to offer a full four-weeks (two, two-week trips) of programming for men and youth on the land. The first program was a full two weeks of fishing and seal hunting at camps and fjords north of Clyde River (February 16-25, 2016). The program had six instructors and seven youth. The second component was a full two weeks of seal hunting and ptarmigan hunting at camps and fjords south of Clyde River. That program had ten instructors and ten youth. The two trips involved travel by skidoo-qamutiik and dog team, and camping in both tents and cabins. The groups hunted for seal through agluit (seal breathing holes) and with nets, and jigged and netted for fish. They hunted seal at the floe edge and also hunted for ptarmigan. All along, the youth learned about ice travel, navigation skills, camping skills, dog teaming and dog care skills, weather prediction, meat preparation, skidoo and qamutiit repair skills, and how to set-up/maintain/break down camp. The youth also learned hunting skills, rifle handling skills, net-making, tool-making, and much more. In addition to practical skills, the youth were told stories and legends about their history and the areas they were visiting. Emphasis was placed on learning traditional place names, and the meanings and stories behind those names. Youth often learned about their own family histories and relatives, seeing the places where they came from and travelled. Bad weather is always a reality in the Arctic, especially in February and March when the program was held. Dealing with bad weather is part of the experience for youth, who must learn not only how to stay safe and create a sturdy camp for riding out a blizzard, but how to pass the time. Youth learn patience and how to be productive when waiting out the weather, by doing activities such as mending clothing and tools. During the periods of bad weather, youth listened to stories and had a chance to talk and bond even more with their instructors and Elders. The beauty of our environment also has a positive impact on everyone involved in land-based programs. We just came back from a week-long, Project Jewel: Father-son Trapper Training program with Angus and Frieda Alunik. All participants took part in a briefing with Angus on trap identification and particular use. All participants were introduced to various types of snares: how to set and construct for the intended animal. Participants were then given the time to familiarize themselves with setting each trap as well as setting it off to appreciate the seriousness of trapper safety and function of each trap. It's important to note that our focus on this camp was to improve the relationships between fathers and their sons while building their skills through traditional and modern knowledge. Both families noted in the debrief that the week was very beneficial to them, and that the one-on-one time that they experienced with each other was very much appreciated. In conclusion, it was a cold week with the average temp hovering around -34C. We did not successfully trap animals but we did see one mink and three moose. Everyone went home satisfied and likely about 5 pounds heavier due to Frieda’s cooking! On November 9 – 20th, the Northern ICE team spent time delivering community wellness workshops at the Cultural Centre in Tulita, NT. Over the three weeks, we spent time together learning through traditional teaching and documentaries, which prompted dialogue and sharing circles. We learned about traditional medicines, feelings and emotions, the Dene language, and ceremony. We discussed food toxicity, medications, disease, and getting to the root cause of what is keeping us out of balance. Community members shared the powerful healing of sharing with one another, and discussing topics that they have not shared with anyone before. It was an incredible month of sharing and learning from one another. This was a wonderful beginning to the Tulita Land-Based Healing Wellness Camp. It is important for us to continue healing through sharing out on the land. The elders and leaders see this and want to make this happen themselves. They say we need to "just do it", instead of letting the fear of making mistakes stop us dead in our tracks. They're encouraged and motivated to take more ownership of making this camp happen. On November 9-10, the Movember Foundation brought together 32 representatives from 21 projects in 5 countries across the world, funded for their work in improving mental health and wellness in men and boys. The goal of this meeting was to allow for connections to be made between different projects, and to discuss how to best approach Knowledge Translation strategies - sharing lessons and findings from projects and communities with each other, funders, policy-makers, media, and the global community at large. It was interesting to discuss how our various projects connected with Movember Foundation's Men's Health Strategy, and more specifically with their Mental Health Strategy. There is quite a diverse selection of projects that have been funded through the grant, ranging from the "Deadly Choices" Campaign by the Institute of Urban Indigenous Health in Australia working with Aboriginal boys and men, to the "Making Connections" program by the Prevention Institute in the United States working with men and boys disproportionately affected with poorer mental health outcomes (people of colour, veterans, etc. ), to the "Bro Talk" project by the Kids Help Phone in Canada providing a phone and instant messaging service for teen boys across the country. It was beneficial for us to discuss our similarities and differences, and to gain an appreciation for the landscape of programs and projects addressing the important issues related to the mental health of men and boys. Moving forward, we are committed to sharing our findings and lessons not only through formal academic channels, but also through our website, social media presence, and by working with Movember to leverage their brand and reach for knowledge translation purposes. It is important for us to share what we learn in order to help make a case for innovative, culturally-relevant programs to improve the health outcomes of the men and boys in our communities. On September 16, 2015, our partners that make up the Movember Circumpolar team met in Ottawa, ON to discuss the importance of land-based mental health and wellness programming in our respective communities, and the impacts that we have seen. The meeting focused on the richness of diversity and similarity that exists across all of our programs. We worked together to highlight what we thought were important components of land-based programs in our communities, and began the development an evaluation toolkit based on evidence-informed measures from the literature, along with additional metrics we would like to see measured. This evaluation toolkit will be used by all six of our partner sites across the North, allowing us to measure impact and effects in a standard way. On November 17, 2014, the Movember Circumpolar team received word that our project, "Pathways to mental wellness for Indigenous boys and men: Community-led and land-based programs in the Canadian North" had been awarded funding of $3 million for 3 years. This funding will support Inuit and First Nations community organizations in Northern Canada to develop, adapt, deliver, and evaluate land-based mental health programs. The project is being co-led by Dr. Gwen Healey at the Qaujigiartiit Health Research Centre in Iqaluit, NU, and Dr. Michael Jong at the Labrador Grenfell Regional Health Authority and Memorial University in Happy Valley-Goose Bay, NL. Our team recognizes that Indigenous communities across Canada and internationally are leaders in the development of innovative, culture-specific mental health and suicide prevention initiatives. This project will build on the knowledge and capacity that communities already have by focusing on existing and new programs that integrate land-based activities with mental health care. We aim to improve the mental health of Indigenous boys and men by targeting factors that promote mental wellness and protect against suicide risk, including cultural identity, personal agency, social support, connection to positive role models, and a sense of community belonging.